Infantry Regiment no 2 of Monrovia during manouvres, some new pattern uniforms have arrived for the officers and musicians, other ranks are still in the french style (figures Irregular Miniatures, with 1 Elite Miniatures Officer (on left)). Step 2 - assemble the frame and cut out the paper covering. The Guard corps has been instructed to mobilise and carry out manouvres. I have instructed the army corps of each province to come into a state of readiness. The Boldovian army corps is to fully mobilise. These will proceed to Heidelheim in Upper Belgravia as soon as they are ready. If further cavalry is needed for patrol duty then a regiment of Uhlans can me made available. His majesty King Leopold IV requests that the army be mobilised forthwith. His majesty takes this step with the greatest regret but must do so to ensure that we are fully prepared, especially with the rising of tension in the region and the fact that other countries are also mobilizing. His majesty specifically asks that a corps of observation be setup in the province of Upper Belgravia to watch the border with Monrovia and to help the local administration deal with with a rise in brigandage and highway robbery. 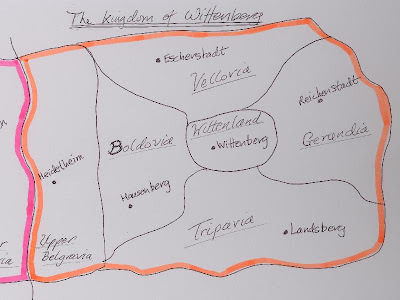 His majesty also directs that the army corps of the province of Boldovia be moblised first and the guard corps in Wittenberg to be brought into readiness. Courtesy of my new digital camera, some pictures of the newly mustered Monrovian jager battalion.